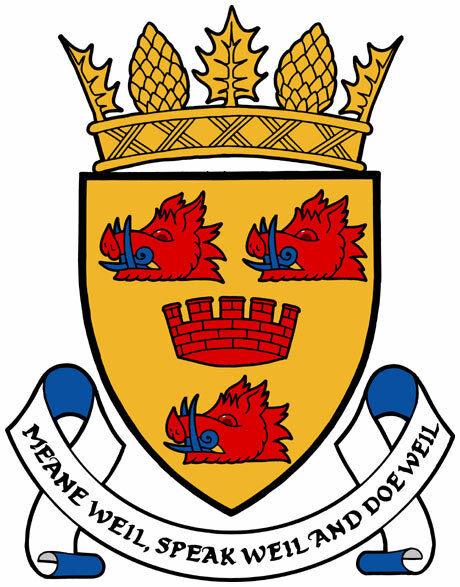 The Crest of Cromarty with three boar's heads. This is the crest for the name Cromarty, there is a different crest for the place of Cromarty. Surely this is the crest for the Burgh of Cromarty, which I thought was based on the Urquhart arms. David? You are correct Estelle. It is based on the Urquhart family crest. Unfortunately this is not the crest for the burgh of Cromarty but as I said before it is the crest for the name Cromarty. The link below should take you to the crest for the burgh of Cromarty. Janet, sorry to quibble but this is the crest for the Burgh of Cromarty. You can see it on the Heraldry Society of Scotland's website in their image gallery of community council arms and on the Cromarty Live community website. Presumably a crest for the personal name of Cromarty would be similar. Your link is to the crest of Ross & Cromarty, which is a large administrative area of the northern Highlands within which the small town of Cromarty is located. Thank you for explaining Estelle, I have looked into it a bit more & have found that the Cromarty name crest has the brickwork crown on the top to replace the fancy crown, so yes it is very similar, I apologise for my mistake & appreciate your explanation.